It is a rare sight to find a pay-to-play MMO that was released in the 90s enjoying a thriving and active fanbase up to now. I can think of a few games that have achieved such a feat but Turbines Asherons Call (AC) is the one on top of the list. Why? AC has shown that even a 90s MMO can still go toe-to-toe in the market with the release of its 100th content update last August, an accomplishment that is exceptional in todays MMO trend. In Asherons Call, you get to choose between four of the human races found in Dereth, the Aluvians, Gharundim, Sho and the recently added Vilamontians. You can then choose from a standard set of job classes of either the magic, the projectile types: the bowhunter, life caster or war mage, or the melee character types: the wayfarer, soldier or the swashbuckler. If you dont want to have a pre-determined job class, you can go for the customize option. The stat allocation for characters is as linear as it can get. Unlike in some games where mixing some stats can get you certain bonuses. In AC, what stat you raise is what attribute you upgrade. After choosing your job and the stats you want to upgrade, you can then allocate the skills your character would have. The skill point allocation in AC is not as diverse like some MMOs. The stat allocation is so simple you wouldnt need to waste too much time in trying to figure it out. After choosing your character skills, you then decide the city where you want to start in. New players wont have to worry too much about their starting location because the cities would only be important in later levels. After choosing the race, job, stats, skill and city for your character, you then choose the appearance of your character. The appearance in AC is where things go downhill, the graphics of the game is dated, and its sprites are composed of blocks. At first glance, you would find it hard to distinguish the difference between the male and the female characters. The design of the clothes lack the intricacies that even free-to-play games have, the color is dull and monotonous making the game atmosphere dreary which I think Turbine was opting for. The dreary colors and blocky graphics are not just seen in the ACs character creation. Monster and NPCs all follow the blocky graphics the AC engine uses. The color scheme is almost the same wherever you go, and it gives the old feel to the game. Another issue is the way the controls feel, you would need to use the w, a, s, d buttons to make your characters move. The camera view is controlled by the mouse. You can also press the spacebar to make a jump. This wouldnt be such a problem if the camera was helpful. There are times when you are moving that your camera would go at odd angles hindering your line of sight. It gets tiring especially to keep on pressing the zero button to center the camera view. ACs battle system is another issue. Unlike most games where you can immediately attack a monster, you need to toggle on the battle system in AC. This is a problem for new players especially if they are facing an aggressive monster. Its tricky to toggle the aggressive and passive mode especially if you are preoccupied with something. This type of battle system slows your response time to monster attacks giving new players an irritating gaming experience. The game hasnt thrived for almost a decade on graphics and gameplay alone. AC is more famous for its engaging storyline and the uniqueness it offers to the whole MMO industry. AC is a rare MMO where the characters and monsters are not from any pre-existing monster lore. You can see monsters in AC that are exclusively for the game. And then there is the society system that is exclusive for AC. You can choose between three factions that are available in the game, the Celestial Hand, the Eldrych Web and the Radiant Blood. Upon registration on the society, you need to accomplish tasks and quests that are exclusively for the society you chose, and on its completion you get to be rewarded handsomely. The society system is also important in the PvP land control that happens in AC. There are three towns in Dereth that your society can control. If you gain a town, you can have access to the highly coveted black market. The black market is a special market that is only available for acquired towns. They sell uncommon materials, items and equipment that is not usually sold in town NPCs. Another unique system in AC is the allegiance system. This is where you can pay homage and loyalty to one lord and the lord would get some of the experience points you have earned. In exchange your lord may provide you items, equipment and money that you need. The trouble is, whatever compensation your lord will give to you is highly dependent on what he has, or what you two have agreed upon. This system is troublesome and could in fact be a problem if your lord would abuse his position. That is why having a lord in AC is a high-risk maneuver that is why I suggest you take it at your own risk. I mustnt forget the most important aspect of AC, the community. AC has a thriving and active in-game community, I think that this is the reason why AC has stayed for so long. Players are connected one way or another. Players in AC are helpful and some would even teach you along the way. This kind of a bustling community is hard to find in other MMOs nowadays. 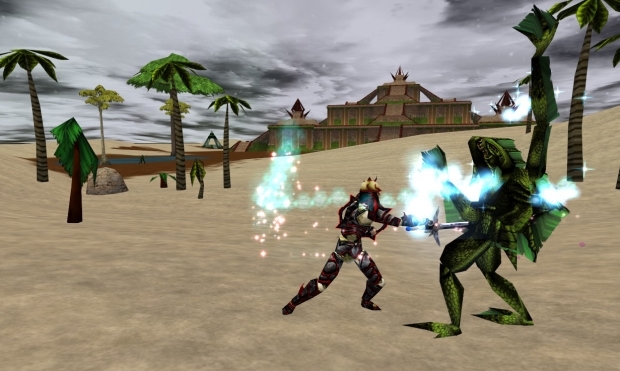 Over all Asherons Call is disappointing in the aesthetics department, with the dated and blocky graphics to the irritating camera angles and controls, new players need a whole lot of convincing to spend their money to play the game. Turbine has successfully kept its long time players with the constant monthly content update. The vibrant and welcoming community is also another thing to consider in AC. The question remains though is that will it be enough to make you spend your money to get a monthly subscription for it? That answer is for you to decide.